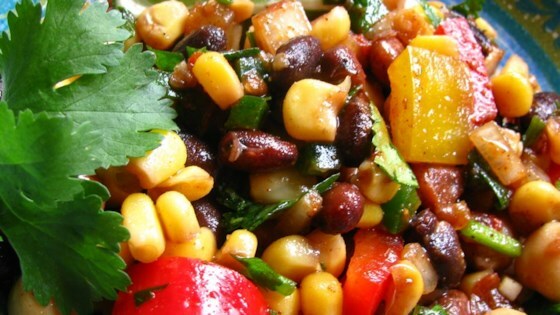 "A spicy bean salad that can also be used as a topping for tostadas." Pour beans into a colander, and rinse under running water. In a large mixing bowl, toss beans and corn together with oil, cumin, chili powder, lime juice, and salsa. Sprinkle with parsley, cover, and chill. This took 5 minutes to throw together. My husband and I LOVE it, as do my kids!! Instead of parsely use fresh cilanto! Also experiment with other beans! Great recipe! This recipe didn't have much flavor and I didn't like the taste of the garbanzo beans with the chili powder. The recipe tastes mainly of chili powder. I will not be making this again. Easy to make and very tasty! Goes well with guacamole and rice. This is awesome as a dip on tortilla chips! Instead of the chili powder, I added 4 shakes of Mrs. Dash's Southwest Chipolte seasoning. It was delish!!!! I am making again right now!!! Quick, easy and versatile. I omitted the parsley, and added freshly snipped cilantro. Also threw in some finely diced onion left over from a different bean salad recipe. Thanks, Heather!